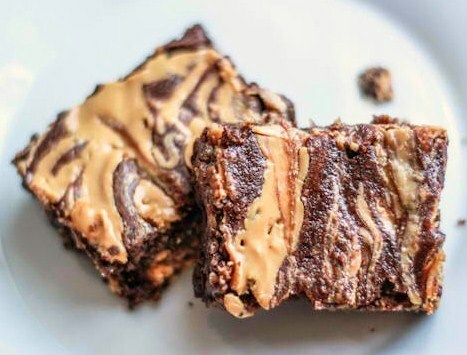 Rich chocolate brownies with swirls of peanut butter and cream cheese filling. 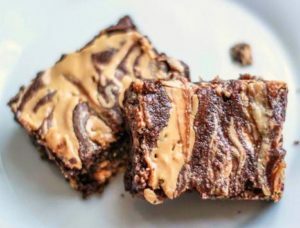 Here is an easy dessert recipe for Marbled Peanut Butter Brownies. Preheat oven to 350°F (175°C). Grease 13 x 9 x 2-inch baking pan. Beat together cream cheese, peanut butter, 1/4 cup sugar, and 1 egg and milk until smooth and creamy. Melt butter in large microwave-safe bowl at HIGH (100%) 2 to 2 1/2 minutes or until melted. Stir in remaining 2 cups sugar and vanilla. Add remaining 3 eggs, one at a time, beating well with spoon after each addition. Add cocoa; beat until well blended. Add flour, baking powder and salt; beat well. Stir in chocolate chips. Reserve 1 cup of batter; set aside. Pour remaining batter into prepared pan. Spread peanut butter mixture over top. Drop reserved chocolate batter by teaspoons over filling. Using knife, gently swirl through top layers to create marbled effect. Bake 35 to 40 minutes or until wooden pick inserted in center comes out almost clean. Cool completely in pan on wire rack before cutting into bars. Store brownies in air-tight containers and refrigerate.